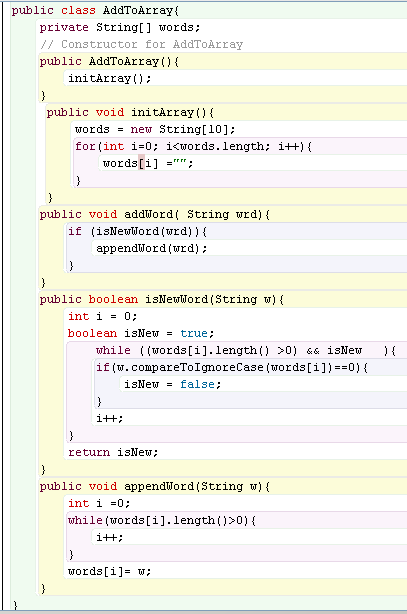 You will need to use some the Java: Strings method to complete this assignment. To parse something is to break it down into smaller parts. For example to parse a sentence into words, you break out each word in the sentence. That is your assignment. To start, do not include punctuation in your sentence. NEW CONCEPT: parameters are passed by value, not by reference. ie. methods only use the values of parameters. The original variable value does not change (yet). Non critical Input errors to check. These errors will be caught by your program and produce the correct results. using an array, count the number of 1 letter words, 2 letters words ... all the way up to words with 10 or more letters in them. using an array, count the number of unique words in the sentence. Assume that there are not more than 15 unique words in a sentence. Make sure that the case is ignored. Output the all stats in the Sentence class. This modification will allow a text file to be read from the computer and parsed.